In the little town in Provence my family calls home, the local farmers market takes place twice a week under dappled light in a large tree-lined square. It is one of my absolute favorites places. In fact, all farmers markets are, as they hold the promise of the unexpected...the first apricots or cherries of the season perhaps, or some plump, ripe figs, magnificent heirloom tomatoes or bouquets of basil and other fragrant herbs. Markets, anywhere in the world, tempt me, and I am drawn to them like bees to nectar for they feed my culinary inspiration. Luckily for us, six days a week in Santa Barbara County you will find, dotted along the main thoroughfares of our local towns, a ritual sprouting of market umbrellas that herald, much like the emergence of wild mushrooms, the bounty from local farmers. As they set up their trestle tables, the delights of each season are revealed, tempting us with their fragrance, beauty, and abundance. Part of each market’s charm comes from its locale and everyone has their favorite; from the quaint, timbered lined streets of Solvang; the beachy, ocean breeze-caressed, laid back feel of the Thursday afternoon market on Linden Avenue in Carpinteria; the hip, musical, bustling vibe of Tuesday evenings on State Street in Santa Barbara, the multi-cultural, student-filled, internationally flavored atmosphere of the Goleta Sunday Market, to the intimate flower and plant filled market that migrates up and down Coast Village Road on Friday mornings in Montecito. I too have my favorites but over the course of the past few months I have rediscovered the attractions of every market in the county and found plenty of inspiration along the way. The Carpinteria market is perhaps the most relaxed of the them all, a true reflection of the beachside community it serves. Kids scamper about with the telltale signs of having sampled sweet summer strawberries and plump stone fruit with their juice stained fingers and sticky cheeks, people stroll up from the beach in sand filled sandals, past the eclectic selection of stands that frame the ocean end of the market and slowly meander past the abundantly filled tables. 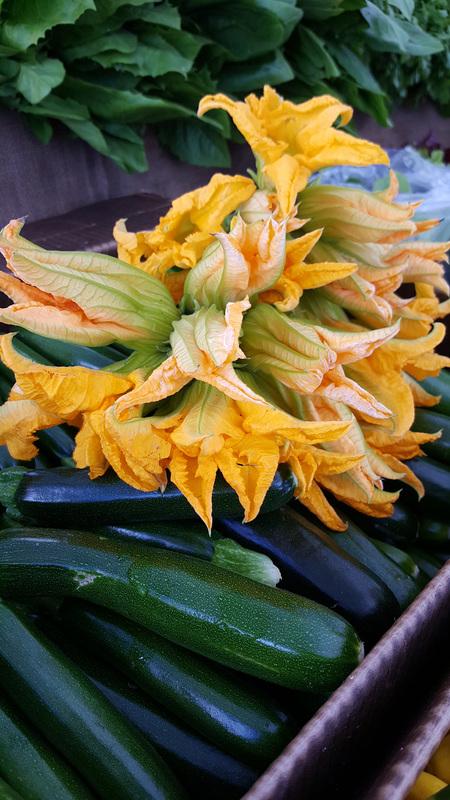 On a recent Thursday I came across some exquisitely beautiful, sunflower yellow squash blossoms. I couldn’t resist and cooked them that very evening, stuffed with a mixture of freshly sautéed zucchini, spinach, some leftover roasted chicken, all mixed with ricotta and mounds of fresh herbs that had perfumed the stalls. I served the cooked stuffed blossoms on a bed of wild greens. My daughter said it ‘tastes like summer on a plate’. Her comment made me reflect how much I enjoy savoring each piece of fruit or each vegetable at its height of freshness. Surely that is one of the greatest pleasures when buying items directly from the farmers, with produce picked just hours before, bursting with flavor and packed with nutrients. It tastes so much better that way! I always feel as though the weekend has truly begun once I’m at the Saturday morning market. I love running into friends and catching up on the week’s news and chatting with farmers about what they have that’s new. It’s where I pick up my eggs, delicious goat cheese from Deb Neal at Drake Family Farms, baskets of berries, a bag or two of decadent dates and fill my baskets with great bunches of herbs which tantalize my olfactory senses. I tend to get carried away when faced with such a treasure trove, which often results in impromptu gettogethers in the garden or on the terrace at home. The meals are uncomplicated, sometimes starting with a simple aperitif, a glass of rose perhaps from local vineyards, and an appetizer of fresh radishes, a baguette, some salt, and butter. The dishes that follow are frequently a collection of salads and roasted vegetables capped off with a fruit tart, a clafoutis or a berry topped pavlova. These spontaneous gatherings are often my favorites, a great way to unwind with friends and truly savor the season. The markets also feed my creative juices when planning special events. My daughter recently celebrated a milestone birthday. She had suggested a picnic in a vineyard with friends and family. I was happy to oblige and asked what dishes she would like, which triggered a remembrance of picnics past. Funny how so many of life’s occasions are memorable because of what we ate. Our conversation took place on a sunny Saturday morning as we ambled past magnificent mounds of produce at the Cota Street market, which hummed with activity as people fillet their baskets with everything from asparagus to round, baby squash, and fragrant peaches to tangy lemons. We munched on raw snap peas as we planned the menu. Nearby colorful beets and spring peas were heaped chest high and the idea for a giant multi-hued salad came to mind. We found some raw black-eyed peas and decided to add those to the dish too. In the end we made a giant salad for twenty people and dotted the top with burrata. We filled the car with prodigious supplies, a patchwork of ProvenÃ§al tablecloths, some freshly baked bread, hot vegetable quiches and a grilled zucchini and tarragon roasted chicken salad. We gathered around a long table set in the vineyard, the warm air singing with crickets, and celebrated her 21st circumnavigation of the sun. 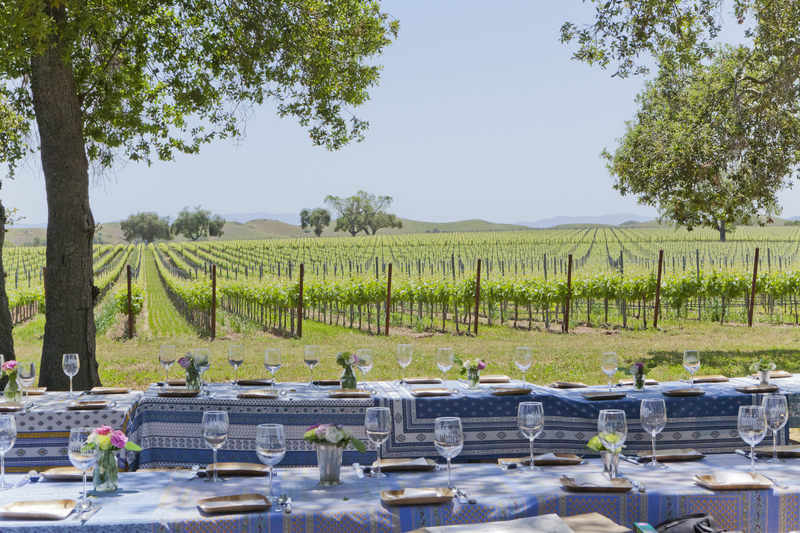 Laughter and conversation filled the car on the drive home through the undulating hills that connect the Santa Ynez valley to the coast, bathed in a golden glow from the setting sun. A kaleidoscope of images rushed through my mind as I recalled her previous al fresco birthday gatherings, from childhood tea parties to springtime feasts in the garden. Birthdays and holidays, by their very cyclical nature mark the passage of time, and the food we prepare to celebrate them are a true reflection of the season, mirrored in the produce we find in our local farmers markets. Whether a special occasion or a spur-of-the-moment gathering, these crops are the palette with which we can create delectable memories. Bon Appetit! Pour a little olive oil into a large pan over medium-high heat. Add the red and spring onions and sauté until lightly golden brown. Stir frequently. 4-5 minutes. Add the squash and zucchini, a good pinch of salt and 6-7 grinds fresh pepper and cook until golden brown. 5-6 minutes. Add the spinach and chicken (if using) and cook until the spinach has just wilted. 1-2 minutes. Place the squash-zucchini mixture in a large bowl. Add the ricotta and all the herbs. Stir to combine. Carefully spoon the mixture into each of the squash blossoms. The petals are delicate so take care not to tear them. Gently twist the top of each blossom to encapsulate the filling. Heat a little olive oil in a large shallow pan over medium heat. Once the oil is hot, carefully sauté the blossoms until lightly golden brown on all sides. As they cook quickly, no more than a minute or two, I like to do this just before serving so that they are still hot. Note: The blossoms go particularly well with a salad of wild greens. You may also have some filling left over – it’s delicious on toast! Place the washed, but unpeeled, beets into a shallow baking dish. Drizzle with a little olive oil and a good pinch of salt. Cook for 35-40 minutes, or until tender when pierced with a sharp knife. They should not be overcooked though. Remove from the oven and let cool before peeling. Once peeled, cut each beet into eighths. Steam the black-eyed peas for 15-20 minutes until just cooked. Drain and rinse thoroughly. Pour a little olive oil into a large skillet placed over medium-high heat. When the oil is hot, sauté the sliced snap peas with a good pinch of salt and 5-6 grinds of black pepper. Cook for 2-3 minutes, until just slightly golden. Remove from the heat and add the lemon zest and juice. Stir to combine. In a large salad bowl, whisk together the mustard, vinegar and 3 tablespoons olive oil until you have a thick emulsion. Place salad utensils over the vinaigrette. Add the cooked black-eyed peas, sautéed snap peas and peeled beets to the bowl, on top of the utensils. Sprinkle the vegetables with the chives and parsley. When ready to serve, toss gently to combine. Spoon some salad onto each plate and top with a piece of creamy burrata. Poulet a l’estragon (tarragon chicken) was — actually still is — one of the dishes that I always looked forward to when visiting France. It’s classic bistro fare, or cuisine bourgeoise. In other words, good home cooking. Every time I find this herb at the farmers market, this is the dish I want to make. This salad pairs moist tarragon roasted chicken with grilled zucchini and a mustardy vinaigrette. To me it is the taste of summer in salad form. Cover the bottom of a roasting pan with the sliced onions. Place the chicken on top and drizzle with a little olive oil. Tuck the tarragon sprigs around the chicken. Sprinkle a little salt over the chicken and then grind some black pepper over the top. Roast for 90 minutes. Spoon the mustard into the bottom of a large salad bowl. Pour in the olive oil and vinegar and whisk together well. It will look like mayonnaise. Place the serving utensils on top of the vinaigrette. Pour a little olive oil into a large mixing bowl and add all the zucchini slices, a pinch of salt and some pepper. Toss to coat. Place a griddle on top of a stove and heat so that it gets nice and hot. Grill the zucchini slices so that they are just cooked. Turn them after 2 minutes. You may have to do this in batches as all the slices may not fit on the griddle in one layer. Add the grilled zucchini to the salad bowl. Place the cooked chicken on a cutting board and let rest for 10 minutes before carving. Carve the chicken, removing all the meat and chopping it up into bite-sized pieces. Add the chicken pieces, the sliced roasted onions and the fresh tarragon leaves to the bowl. When you are ready to serve, toss the ingredients well so that everything gets nicely coated with the vinaigrette. Note: Deft use of the herb is key, as the slightly anise flavored herb can be overpowering if used in large quantities. Last summer was boiling hot, as in too-hot-to-even-think-about-cooking hot. We ate gardens of salads and drank gallons of very cold drinks. One sweltering Saturday morning at the market, I sampled green melons that were so fresh and flavorful that I thought I would try making a chilled soup with them. This was the refreshing result -- perfect for a summer’s day, boiling or otherwise. Place all the soup ingredients in a blender and puree until smooth. Alternatively, place the ingredients in a deep bowl and puree with an emersion blender. Chill the soup for a minimum of 1 hour. 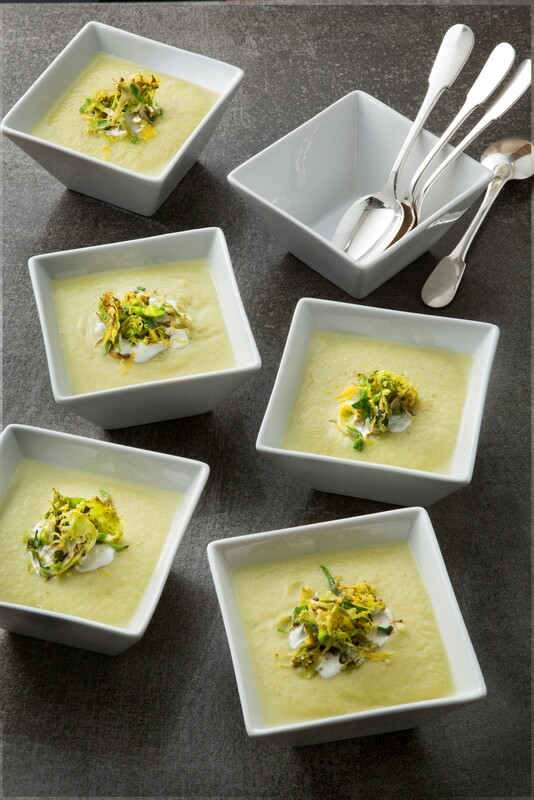 15 minutes before serving the soup, combine all the garnish ingredients in a medium bowl and toss well to combine. Ladle the soup into eight bowls. Spoon some of the garnish into the center of each soup bowl and sprinkle with a little pink flake salt just before serving. Market Days: The markets, which began in 1983, have proliferated throughout the county both in locations and numbers of farmers. In the height of summer, it is not unusual to have 110-120 different farm stands at the largest, Saturday morning market in the heart of Santa Barbara. For the past sixteen odd years I have met almost every month with a group of friends to discuss books. At least that is the premise of our little ‘book’ club. We discuss a lot more. Over the years, as our lives have crisscrossed each other’s, and as we have watched our children grow, we have giggled and laughed out loud, cried tears of joy and anguish, cheered on our kids from the sidelines and rejoiced in all the milestones as our families have evolved. We gather around each other’s dinner tables, share a meal and talk. This past January was to be no different. Two days before our get together the usual string of emails flurried back and forth; ‘I’m bringing a salad’, ‘I’ll bring dessert’, “Wednesday at 7pm – see you then’, and so on. The New Year had bought clement weather to the Central Coast and a sense of peace had just begun to settle upon the town, so for everyone who lived through the long, ash-filled, weeks of the Thomas Fire, the very thought of the impending storm on January 9th was ominous. Everyone along the entire coastline held their collective breaths and hoped we would all survive the dire predictions from the weather forecasters. Our nerves had already been rattled by weeks of incessant safety alerts on our phones, and everyone was tired: tired of evacuations, tired of packing and unpacking, tired of masks, tired of coughs, tired of the ash that crept into every nook and cranny, just plain tired. “Our house has gone.” was the shocking first reply. “Well, I won’t be hosting book club here anytime soon” came the second. Over the course of the next few hours it quickly became apparent that mother nature had wrought its worst. The mudflows decimated Montecito and the surrounding hillsides. Everyone was in shock. Thousands of people were displaced. Everyone checking in on everyone else and wondering what on earth we could do to help. Helicopters flew incessantly overhead ferrying the wounded and evacuating those trapped. It sounded like footage out of a war zone. Everyone asking questions, who is missing? What happened to your home? When did you get out? How are you? Where are you going to go? Can you get to work? Can you get home? That first night as my family gathered in the kitchen, displaced friends arrived with their harrowing tales. I did what many people did that night, I cooked for them. Comfort food, lashings of it. Over the next few weeks this became our evening ritual. I cooked more food, more friends arrived, a bottle (or two) of wine was opened, we would nibble on some cheese and then sit down, eat and review the day. As we communed together we found our collective strength. I realized as the days wore on, that this catastrophe triggered a visceral reaction in me. Sudden memories popped up at the most unexpected times, reminding me of past natural and not-so-natural disasters that we had lived through, all of them, oddly, occurring in the middle of the night. From fires and earthquakes to intruders, these unsettling events prompted a desire to be with our friends and family, to see and hold each other, and to draw solace from our common experience. We gathered around the table then too. Two plus weeks into this odyssey our motley book club crew got back together, all of us finally in town, straggling in from disparate parts. We cooked up a storm as the saying goes, huge bowls of salads, roast vegetables and lasagna. We toasted one and other, grateful that we were all in one-piece, shared stories and laughed, and laughed, and laughed. How good that laughter felt! After everyone had gone home, I stood in the now quiet kitchen, putting away the last of the dishes, reflecting on the evening, the extraordinary survival stories, and the good fortune that meant we were all still alive. Others; friends and neighbors, fellow Santa Barbarians, had not been so lucky, swept away by a twist of fate and a wall of mud. We mourned those lost, and turned to face the gargantuan task of rebuilding. In that process, a new sense of community and camaraderie emerged from the mudflows, not just in Montecito, but throughout the county. People offered strangers their guest rooms, guest houses and couches to sleep on, bucket brigades were formed to clear out the mountains of mud, and cash mobs organized to support local businesses that have been devastated, up and down the coast, by month-long closures. Social media was flooded with messages championing ‘buy local, shop local, stay local’. As I drove around town in the weeks and months that followed, picking up vegetables from the farmers market, fish from the harbor and cheese from my favorite fromagerie I was reminded time and again, that in times of crisis, the very act of sharing a meal with friends gives us comfort. Now, as we head into spring I’m looking forward to more spontaneous lunches and dinners in the garden, grateful to be sharing our local bounty, and happy, just to be with friends gathered around the table. This is a menu for such an occasion - Bon appetit! 1. Bring a large saucepan of salted water to a boil. Add the farro and cook until al dente, and slightly chewy in texture, about 15-25 minutes. The best way to check for doneness is to taste! Drain the farro, fluff with a fork and let cool in a bowl or spread out on a rimmed sheet pan. 2. Pour a little olive oil into a medium skillet over medium heat. Add the broccolini, a pinch of salt and 4-5 grinds pepper, and cook for 2-3 minutes or until just softened. 3. In a large salad bowl, whisk together ¼-cup extra virgin olive oil, the lemon zest and juice, a good pinch of salt and 6-7 grinds fresh black pepper to form an emulsion. Place salad servers over the vinaigrette. 4. Add the cooked farro, broccolini, shaved asparagus, watercress and almonds to the bowl, placing everything on top of the utensils. When ready to serve, toss well to combine. Top with the shaved parmesan. Serve warm. Note: A lovely, heartier variation of this salad is to add a poached egg onto each person’s salad. The egg is delicious when mixed in with the vegetables and farro. I love poached salmon for festive occasions and large gatherings. The beurre blanc sauce is a luscious extravagance (not a sauce I eat every day of the week) but perfect for a special treat. 1. Put all the ingredients in a large pot and bring to a boil, then reduce the heat to a simmer, cover and cook for 20 minutes. 2. After 20 minutes, strain the court bouillon, discard the vegetables and let the liquid cool to room temperature. 1. Place the salmon on the rack in a fish poacher (it is difficult to poach a fish of this size without one, or use a very large shallow pan) and carefully pour in enough cooled court bouillon to completely cover the fish. Add some fresh dill or fennel fronds and the shallot slices. Bring to a simmer over medium heat. 2. Simmer the fish gently until cooked through (count on 7 – 10 minutes per inch thickness of the fish in cooking time). Lift the rack out of the poacher and set it on top of the poacher at a slight angle to let the bouillon drain. 3. Gently turn the salmon over onto a serving platter and remove the skin. Serve with the beurre blanc sauce and roasted potatoes below. 1. Pour the olive oil into a medium-sized saucepan placed over medium-high heat. Add the shallots and cook for 2-3 minutes until barely golden brown. Add the vinegar and white wine, and cook, stirring occasionally until almost completely evaporated. 2. Pour the court bouillon (or fish stock) into the pan, add the cardamom pods and bring to a strong simmer. Cook for 3 minutes. Add the cream and continue cooking until slightly thickened, about 2 minutes more. Reduce the heat to low and add the pieces of butter one at a time, whisking constantly. Do not let the sauce boil as this will cause it to separate. Add the lemon juice, lemon zest, orange juice and orange zest, and add the salt and pepper to taste. Finally add the chives and whisk again. This dish combines two of my favorite foods — fingerling potatoes and pesto. I love to find the first spring potatoes at the market and experiment with different preparations. This one is quick and easy to make. The dish pairs well with green salads, haricots verts and roasted kale, all sorts of roasts and alongside poached salmon. 2. Place the potatoes on a shallow baking tray. Drizzle with a little olive oil, sprinkle with a little salt and add 6-7 grinds pepper. Roast the potatoes until they are golden and fork tender, about 30 minutes. 3. While the potatoes are roasting, prepare the pesto. Place the basil, parsley and cilantro leaves into a food processor. Pulse until the herbs are finely chopped. Add the parmesan and pine nuts. Pulse a few times more to combine the ingredients. With the machine running, pour in the olive oil and process until well blended but still moderately coarse. 4. Slice open each potato lengthwise. Do not slice all the way through. 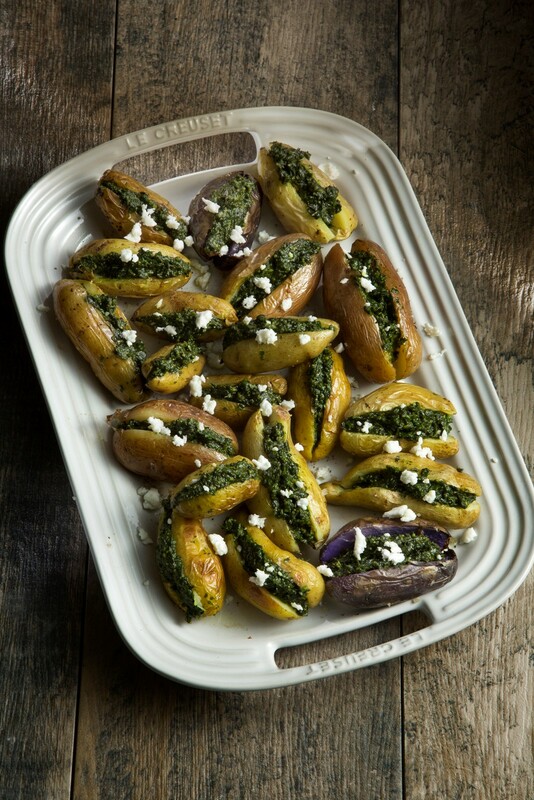 Spoon some pesto onto each potato and dot with the crumbled feta. Serve hot. In the first century AD, Pliny the Elder wrote in his remarkable book Naturalis Historia, "The Muscat grape has been grown for a long time in Beaumes and its wine is remarkable." My grandmother obviously agreed with him as Muscat de Baumes de Venise was one of her favorite wines. She loved to have a glass of it as an aperitif. I distinctly remember the first time she allowed me to have a taste. It was light, not too sweet with the fragrance of orange blossoms and honey. I was therefore intrigued, whilst reading an old magazine on Provencal desserts, when I came across a cake using this wine and adapted the recipe to the cake we have here. Unfortunately my lovely “Mamie” had passed away before I could make it for her. This cake is a tribute to her and to all the “delices” she used to make for me as a child. 1. Preheat the oven to 400 degrees. Coat a 10-12 inch cake tin with a removable bottom with a little olive oil. Set aside. 2. Whisk the egg whites until they hold firm peaks. Set aside. 3. Place the butter in a large bowl. Using an electric mixer, beat until creamy. Add the sugar and beat 1 minute more. Add the orange juice and beat until smooth. 4. Whisk in the lemon zests and juice, and then add the egg yolks one at a time, whisking until you have a smooth mixture. 5. Add the flour, salt and wine to the egg yolk mixture and whisk until well combined. The batter may look a little granulated. Don’t panic. 6. Gently fold the egg whites into the batter. Pour half of the batter into the prepared cake tin. Distribute half of the grapes over the batter. Cover with the remaining batter and then scatter the remaining grapes over the surface. They will sink a little. 7. Cook the cake for 30 minutes. Open the oven and carefully sprinkle the combined sugars and slivered almonds over the surface of the cake. Bake for a further 5-10 minutes or until a knife inserted into the center of the cake comes out clean. Remove from the oven and serve at room temperature. The wall behind my desk is lined with wooden shelves, crammed with a cornucopia of cookbooks from around the world. They feed my inspiration. I disappear into them and in an instant, am transported to the souks of Marrakesh, the dappled light filled markets of Provence, the fish markets of Marseille, the farmers markets of California, and beyond. Piled onto the shelves are also food memoires, technical cook books, restaurant cookbooks and massive culinary dictionaries. They come in all shapes and sizes, illustrated and not. Some are new, some rather old, a few are battered copies that I have carted half way around the world, filled with scraps of paper marking a recipe or story of note. Through them I travel the continents and explore the culinary treasures they encompass. It wasn’t always thus. I became aware of the act of cooking long before I was aware of cookbooks as a source for recipes. My mother and grandmother just cooked with nary a book in sight, creating dishes with seeming effortlessness. I assumed that I would acquire the same repertoire just with my proximity to the kitchen, and that seemed to be the case as I was put to work at a young age chopping vegetables and sorting salads, or learning to make béchamel with a guiding hand on mine. My grandmother, a refined cook of classical French dishes, produced multi-course meals at the drop of a hat. Little did I realize that she had not passed her culinary prowess and knowledge onto my mother, but rather, furnished her, soon after her marriage, with a book which should provide her with the answers to all matters related to the kitchen. The book in question was the daunting, red leather bound La Cuisine by Raymond Oliver. Filled with thousands of recipes, it was a tour de force, a lexicon of classic French cooking. I soon discovered that my mother would consult it before any major dinner party and labored for hours over extravagant creations such as festooned pheasants. It was the source for the now infamous (in our house at least) canard Ã l'orange, a 40-hour, never to be repeated, cooking odyssey. As I got older I poured over its pages, digesting recipes for everything from fantastic terrines to towering piÃ¨ces montées, and returned to it annually to finally master what became my then signature dish, a PÃ¢té en CroÃ»te, filled with layers of marinated meats encased in a buttery, flaky crust. The book is filled with gallentines, aspics, gastriques, sauces that take two days and 38 ingredients to prepare, dishes that never see the light of day in a family kitchen and the assumption that all readers of the book had more than a modicum of cooking knowhow. It was imposing and challenging. It seemed to me, at the time, that either one cooked simple meals or great feasts with nothing in between. The next books I acquired did nothing to dispel this perspective. I was born, fortuitously, into a family of self-avowed food fanatics where driving a few hundred kilometers for a good meal was not unheard of. Driving across any part of France meant an in-depth study of the famed Guide Michelin, a copy of which was always kept in the glovebox. Trips were planned accordingly, and, if the chef had by chance written a cookbook, I would sometimes be the lucky recipient, complete with a signed menu from the establishment to commemorate the occasion. I paged through these books reverently, salivating over the exquisitely produced dishes, never imaging that I would re-create them in my own kitchen. My cooking at this point was of a hearty country variety. These books fueled my curiosity, a guide if you will to the nec plus ultra. 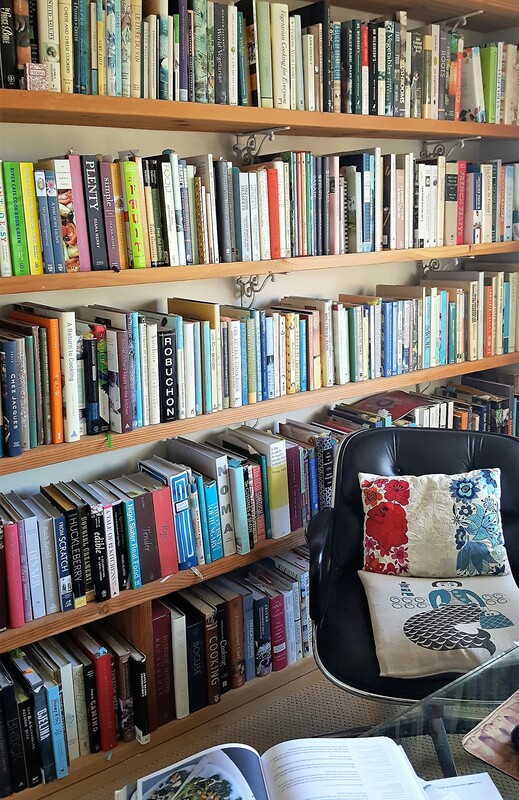 Our passion, as a family, for all culinary matters was matched by our passion for books which were piled high in various corners of the house. When Time-Life Books started their subscription series my mother immediately signed us up. We eagerly anticipated the monthly shipments on geography, history, photography and cooking. I relished the latter, The Good Cook/Techniques and Recipes. From these technically precise books I learnt how to make, amongst other things, floating islands, buttery shortbread and marmalade. These books became my reference library. It was only when I moved to Los Angeles that I discovered food writing of another genre. Here I found Alice Walters, Mollie Katzen and Gourmet Magazine. The writing was comforting and approachable. I felt at home with this food and it proved to be life-changing. A single recipe in Gourmet magazine transformed the way I cooked. The recipe – a scallop and shrimp poached ‘sausage’ with a beurre blanc sauce - was the catalyst that propelled me into the food business. Up to that point I had used recipes as guides to flavor combinations, and referred to books to learn a particular technique. I restyled all recipes to fit with my somewhat casual Provencal-French country cooking. That recipe challenged me to push boundaries and explore new dishes. Successfully executed I went back to my old French cookbooks and dove headfirst into their texts, cooking my way through chapters of Raymond Blanc, Michel Guerard’s Cuisine Minceur and Cuisine Gourmande, the Roux Brother’s and George Blanc’s sumptuous chicken dishes. I started keeping notebooks filled with menus so that I didn’t feed my friends and family the same dish twice. These cookbooks propelled me, fed me, nourished my curiosity and my taste buds. I devoured the Chez Panisse Menu Cookbook, basked in Mireille Johnson’s Cuisine of the Sun, and plunged headfirst into the Silver Palate. I read these books cover to cover, gobbling up recipes, filled my head with flavors, swimming in glorious sauces flavored with spices from around the world. The more I read and cooked, the more curious I became. My culinary horizons now stretched well beyond France’s borders and spilled into every country surrounding the Mediterranean, drawing on the multi-flavored palates of the Iberian Peninsula, North Africa, Persia, Israel, Turkey, Greece and Italy, and then further afield to the foods of India and Asia. I travelled vicariously through the pages to these countries and discovered I wasn’t alone. In speaking with many of my fellow cook book obsessed friends and food professionals, I found a similar trait. Evan Kleiman, (Host of KCRW’s Good Food) a voracious reader of all things culinary from an early age, said this “voyeuristic exploration connected me to the fact that all people were not white Americans and food was not just meat, potatoes, and salad with dressing.” She read ethnic cookbooks as novels, and the works of Elizabeth David and Claudia Roden that opened the door figuratively and literally to another world. With the proceeds from baking cookies she travelled to Italy to explore, eat and cook the food she had read about. There, she found older Italian cook books, some with no lists of ingredients, just evocative narratives with general directions, imbued with the essence of the region they represented. For this very reason, both Kleinman and James Beard Award winning author Clifford A. Wright, have a penchant for cook books written in Italian. Evan Kleinman carried the books back to California to add to her growing collection, amongst them, favorites such as La Cucina di Mia Casa by Zenone Benini and the works of Franco Muzzio and Slow Food founder Carlo Petrini. I was struck, as I discussed the cookbook collections with their owners, that although they varied widely in scope and focus; Nancy Oster’s (recipe editor for Edible Santa Barbara) has a strong baking bent; Jill Johnson (Food writer and social media maven) hunts down Junior League cookbooks; Harriet Eckstein’s (Santa Barbara based graphic designer and cook book editor) collection is eclectic, a true reflection of her peripatetic journeys around the world; Tracey Ryder’s (co-founder of Edible Communities) is filled with French and vegetarian books; Local favorite Chef Pinks’ is inspired by many fellow restauranteurs; everyone spoke of a cookbooks’ capacity to reveal a culture through the cuisine they explored. Finding marginalia, stained pages, faded letters and notes tucked into old books are all part of their charm and mystique. They represent a tactile historical record of the books life. Evan Kleinman told me that she had purchased a second copy of Marcella Hazan’s book on Italian cooking as the first one had fallen apart from constant use. Tracey Ryder, told me that after having read her books cover-to-cover she puts sticky notes on all the recipes she wants to cook later. My dilapidated copy of the Silver Palate is decorated with drawings and comments on when I made a particular dish and who was there, the index annotated with tick marks against the recipes I completed, with shopping lists tucked into the now loosened pages. Looking back on these annotations and saved recipes I see how my cooking has evolved and how my tastes have changed! Like music that echoes an epoch, so do vintage cookbooks. I spoke with Dianne Jacob, acclaimed author of Will Write for Food about her collection and which cookbooks she was particularly drawn to. She spoke reverently about the food of the Cochin Jews, in particular a book by Mavis Hyman entitled Indian-Jewish Cooking, and books related to her heritage. Burros, Marian ‘Not Just Spices on His Shelves’ The New York Times July 31st 2012. My favorite days, wherever I find myself in the world, be it California, London or Provence – the places I call home – are market days. I eagerly anticipate them. I love to meander from stall to stall, to linger, to smell, to taste, to soak up the atmosphere unique to each locale, to chat with friends, talk with farmers about their latest harvest and strike up conversations with passersby. Season after season, these farmers markets stir my creative juices and literally nourish me, body and soul. My rhythms of the seasons are punctuated by my visits to the farmers market. For some, winter markets seem tedious, an uninteresting parade of little more than Brussels sprouts, potatoes and onions. 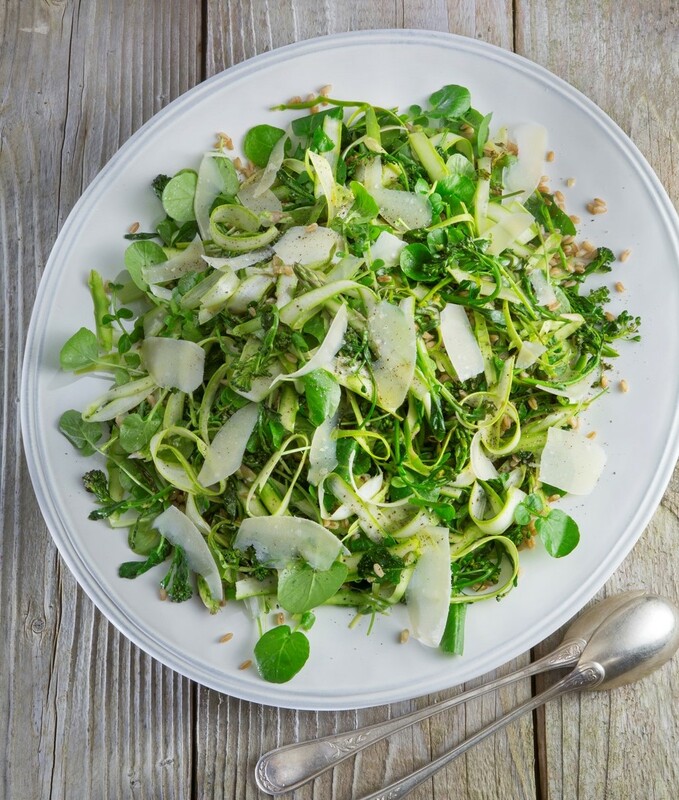 While those vegetables are certainly abundant during this season, there are so many more fantastic choices, such as vibrant winter greens, watercress and rainbow-colored chard, and so many creative ways to transform even the stodgiest of dishes. 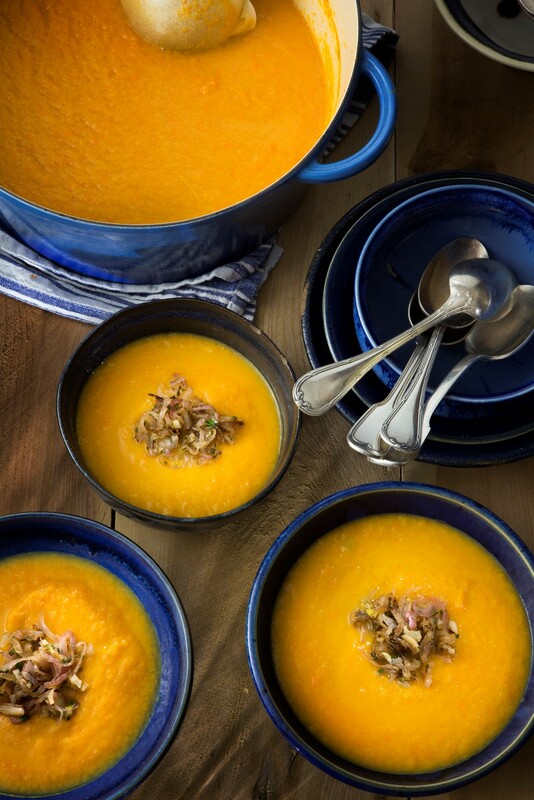 I also love the fruits of the season – blood oranges, persimmons, pomegranates and Meyer lemons – and how they enhance the vibrant color and freshness of rich carrot purees, brighten a roasted acorn squash salad, or transform a simple cauliflower into a curried soup piled high with lemon scented crispy shaved Brussels sprouts. I like, too, how they perfume, enliven and complement winter vegetables and bring a tangy freshness to otherwise traditional winter comfort foods. After a long cool winter, I often crave not only some warm sunshine – yes, even in California – but spring vegetables with their crisp, bright, herbaceous flavors. I have always felt as though, after months of hibernation, the earth has awakened and decided to shower us with a multitude of delicacies, each one fresh, invigorating and tempting, prompting a type of visceral spring fever. I admit I tend to go a little overboard at the market when I spy the first of the season’s small purple artichokes and freshly picked spring asparagus; that I will go plunging into a pyramid of peas, or lust after luminescent fava beans and pea sprouts; that I gather up baby zucchini with bright yellow flowers by the basketful; and pick an abundance of fresh herbs and bouquets of basil — lemon-scented, Thai and purple. Is there anything better than filling your market basket with these eye-popping vegetables, then coming home, preparing them, and cooking them in a multitude of ways or simply drizzling them with a fruity olive oil and a pinch of coarse sea salt? 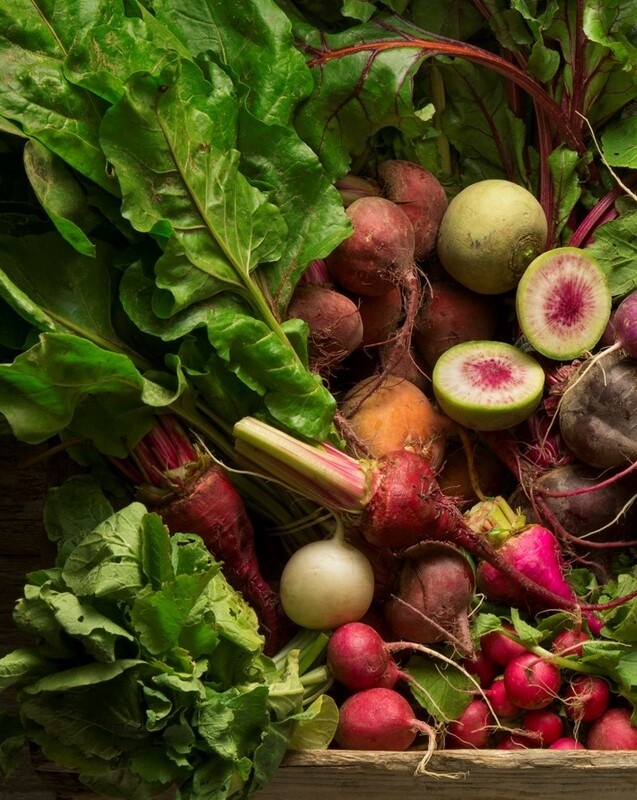 Just when I think the markets cannot get any better, summer vegetables come bursting to life, and the farmers market tables groan under the weight of magnificent heirloom tomatoes, plump purple eggplants, colorful whimsical pattypan squash, multi-hued haricots verts and sundrenched corn. It’s food that makes me want to dine outside, to have barbecues, picnics and languorous afternoons on the grass while eating bowls of bright salads and grilled vegetables accompanied by a cool tzatziki, some freshly baked bread and some cheese. Then, as the days grow shorter, the leaves turn golden hues, and a chill creeps into the nighttime air, my thoughts turn naturally to the autumnal dishes that comfort me. It’s time for big bowls of soup made from sculptural autumnal squashes and roasts with masses of the root vegetables I find piled higgledy-piggledy on market tables. It’s a time for risottos with wild mushrooms and spiced tagines with parsnips, pumpkins, onions and multi-colored carrots. I always think of the autumn as a time of gathering – a bringing together of family and friends, a harvest of sorts, a reaping not only of autumnal crops, but of the year’s hard work before we settle in for the winter months. It is also the time of year for the feast-to-end-all-feasts: Thanksgiving. In the years since I have called California home I have embraced this tradition above all others. I adore this holiday. What could be better than a daylong celebration about food!? I have to admit that in the thirty or so years since I have been preparing this meal, I have come to appreciate, dare I say it, all the side dishes more than the turkey. Last year I suggested that we have a feast entitled ‘everything but the bird’ only to be met with vigorous opposition. I notice however that all the accompanying dishes have taken on greater prominence and multiplied. Whereas in the past I may have made one salad, now we’ll have two or three, perhaps a salad with golden, crunchy fuyu persimmons, one with roasted root vegetables such as parsnips, and one with roasted kale, dates, pecans and packed with herbs. Last year we made not one, but three different types of carrot puree whose colors reflected the carpet of leaves falling from the trees outside. I made grilled Brussels sprouts, mashed potatoes with celeriac and crÃ¨me fraiche (a nod to my French roots) and stuffed acorn squash. The abundant meal fed everyone for days which was (and is) part of its pleasure. The weekend was filled with long walks, afternoons making puzzles, reading books and delving into the fridge for a tasty morsel. One night I made a large pasta dish using up all the remaining stuffing and vegetables as part of the sauce – delicious! As we head into Autumn once more, I’m looking forward to ambling through the weekly markets in the months to come, to discover a hidden gem, possibly a new apple or squash variety, and to planning, testing, and tasting innovative dishes for this year’s feast, with a new soup, salad or gratin perhaps. This is part of the fun, the enchantment that comes from foraging for ideas amongst the market tables. Happy hunting and bon appetit! Cauliflower is a versatile vegetable that lends itself to all manner of preparations--everything from shaved raw or roasting whole, to being grated for “risotto” or blended for soups. It also absorbs flavors well, but one must be careful not to overpower it with too strong a spice or herb. Curry is a perfect complement to cauliflower, and in this soup, it creates a fragrant backdrop for the pureed vegetables. I like to serve puréed soups with a little garnish that provides texture. In this instance, it’s the Brussels sprouts which add a little crunch and a lovely earthiness to the gentle, sweet flavor of the cauliflower. Pour the olive oil in a large saucepan over medium heat. Add the onion, leeks and curry powder and cook for 4-5 minutes, stirring frequently until the onions are softened. Add the cauliflower, a good pinch of salt and 10-12 grinds pepper, and continue cooking for 2 minutes. Add the vegetable stock to the saucepan and simmer until the vegetables are tender, about 20-25 minutes. Remove from the heat and purée the soup using an immersion blender. For a smoother texture, pass it through a fine mesh sieve. Cover and keep the soup warm until ready to serve. Pour a little olive oil into a medium skillet over medium-high heat. Add the Brussels sprouts, a good pinch of salt and 4-5 grinds pepper. Cook, stirring frequently until the sprouts are golden brown. Add the chives and lemon zest and toss to combine. Serve the soup in warmed soup bowls. Place a dollop of crÃ¨me fraÃ®che in the center of each bowl and top with a spoonful of the crispy Brussels sprouts.